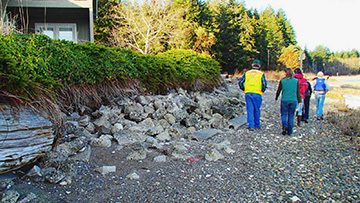 Most Puget Sound beaches have low to moderate erosion rates; few are in high-erosion zones. 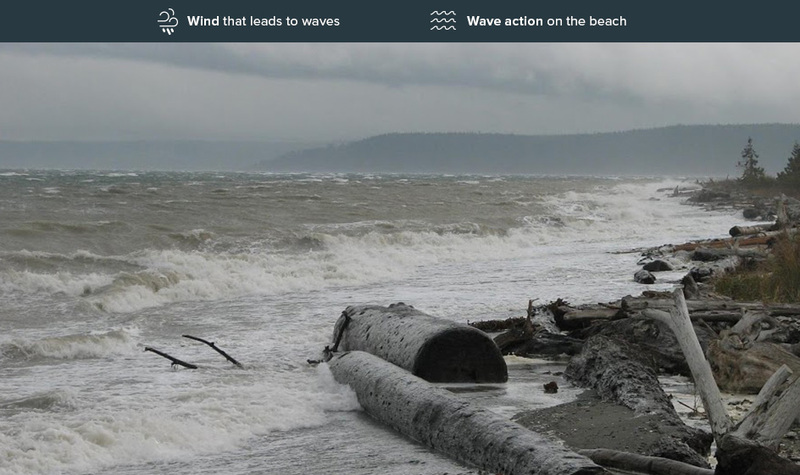 These are mostly places with heavy winds and high waves, such as the western side of Whidbey Island and some south-facing beaches. Sand spits, which are made of fine sediment deposited by the currents, can also be subject to heavy erosion and flooding. 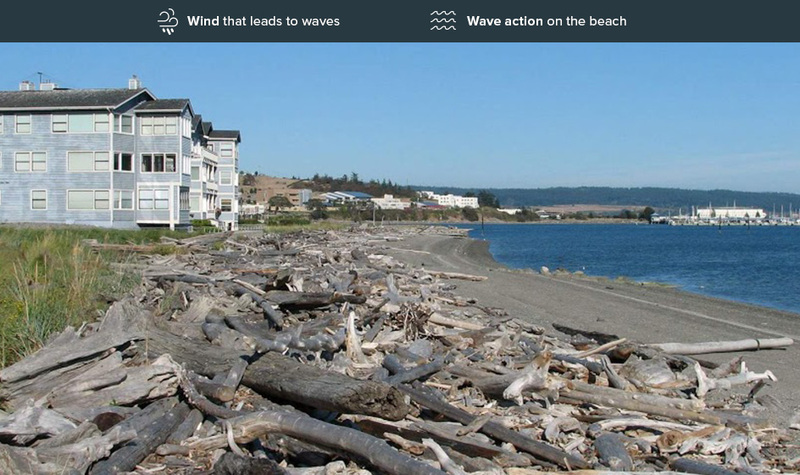 On beaches, native plants and drift logs help dissipate wave energy. 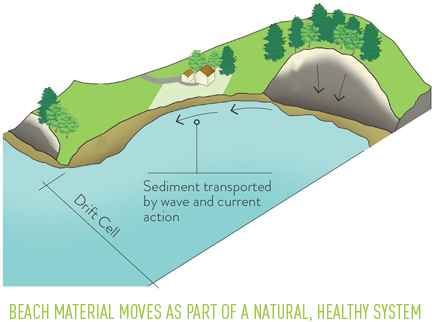 Without the interference of bulkheads and seawalls, beaches will usually erode gradually but will also be replenished by sand and sediment from nearby bluffs and beaches. This process provides healthy habitat for species ranging from insects to salmon to orcas. Ironically, bulkheads can lead to more rapid erosion of beaches in some cases. While these structures can provide some erosion protection on your property, they contribute to overall beach loss by reducing the sediment supply. And when waves reflect off a bulkhead, they scour the area at its base and on adjoining beaches. 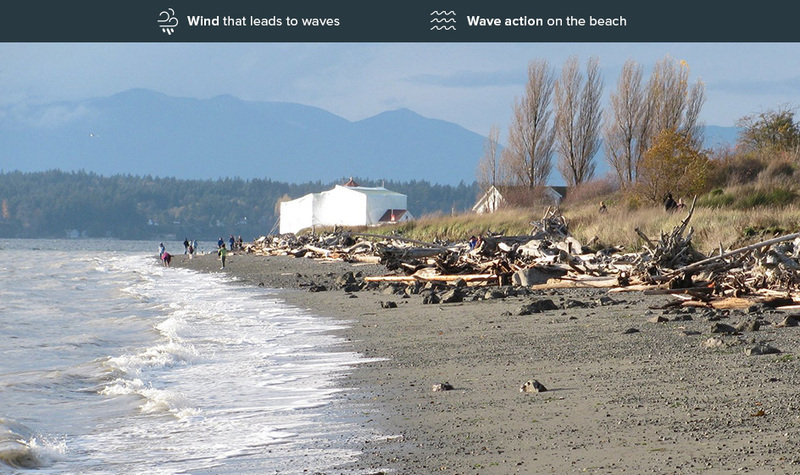 Over time, an entire stretch of beach will become coarser, with less sediment and more gravel. The bulkhead could also eventually crack, tilt, or collapse. You can reduce erosion risk on your beach by following proven management practices—such as ensuring that rainwater and roof runoff are diverted away from slopes, leaving trees and vegetation intact, adding native plantings, and building stairs and trails in a way that allows for natural erosion but doesn’t aggravate it. A qualified coastal professional can evaluate erosion risk on your beach and suggest measures you can take to protect your property. If bluffs and beaches are allowed to erode naturally, their sand and sediment will help build up beaches as sea levels rise. But if bulkhead construction increases, more of those materials will be locked up.  Either way, rising waters are likely to breach or damage many bulkheads. A better alternative is soft shore protection, which can mitigate the effects of sea-level rise without harming native species, which already face the threat of warmer and more acidic waters.